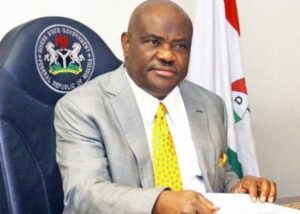 Rivers State People’s Democratic Party (PDP) Chairman, Felix Obuah has said that the State Governor’s re-election goes to show that God is a miracle worker, dedicating the victory to God and the people of Rivers. The State PDP Chairman revealed this to journalist shortly after the declaration of Governor Nyesom Wike as the winner of the March 9, 2019 governorship election in the state, The Sun reports. Obuah joined the crowd to congratulate Governor Wike, adding that his victory had once more put an end to doubt about God’s infallibility, especially to those who place their trust in Him. He said, “This victory has gone to show that our God is a miracle worker. God has clearly shown that the fervent and heartfelt prayers being offered by Rivers people on daily basis were not in vain. Truly, He has disappointed all the counsel of Ahithophel including all those who arrogate the place of God to themselves. “Knowing that ‘Mr. Projects’ is ever magnanimous in victory, I urge all Rivers people, including those candidates, who lost out in the election, to cooperate and work in harmony with Governor Wike, to hasten the development of our dear state.” Obuah said. Warning, Obuah said, Wike’s victory should serve as a reminder to political office holders that they should not take people for granted and ensure that people-oriented programmes at the grassroots are taken serious to bring about the desired social and economic change needed. He commended the Independent National Electoral Commission (INEC)’s Resident Electoral Commissioner (REC), Ubo Effanga, security agencies and all who made effort to ensure peaceful and orderliness conducts during the State’s election. This entry was posted in Christianity, Faith, News, Politics and tagged Felix Obuah, Governor Nyesom Wike, Ubo Effanga. Bookmark the permalink.